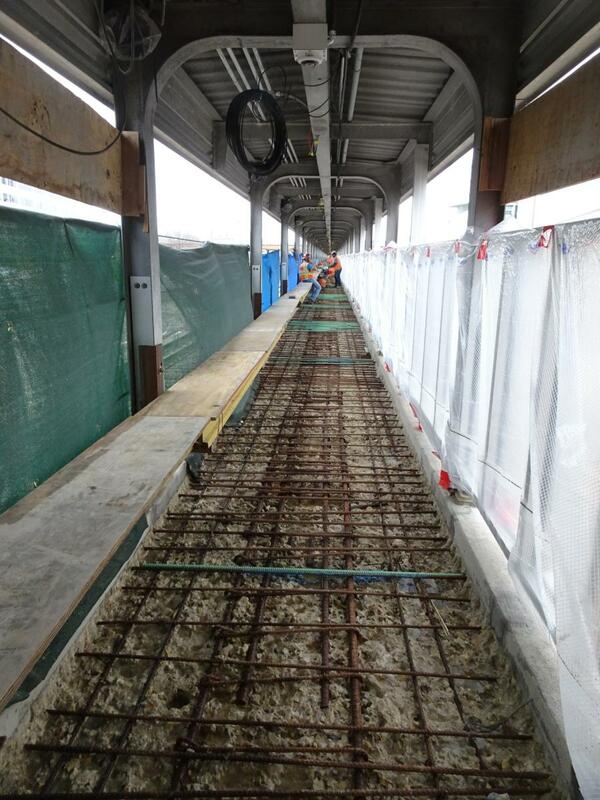 Crews rebuilt Illinois Medical District Blue Line Station in Chicago beginning in 2016. The finishing touches on the Chicago Transit Authority's (CTA) $23 million Medical District Station Renovation will be completed by late 2018, bringing closure to a project that will help upgrade of the Forest Park Branch of the Blue Line — the third busiest station on the line, which serves over 1 million passengers. Chicago Mayor Rahm Emanuel officially opened the new Illinois Medical District Blue Line Station at a ribbon-cutting ceremony Aug. 21. The work to renovate the station is being done by a joint venture of James McHugh Construction Co. and UJAMAA Construction Inc. Construction began in September 2016 and was funded by local taxes. "This is the largest makeover of the station since it opened more than 50 years ago," said Irene D. Ferradaz, a CTA media representative. "We're rebuilding the main stationhouse, increasing accessibility for customers, and providing a number of amenities to the popular station that offers access to major renowned hospitals and health institutions." The station provides key connections to four major hospital systems — the University of Illinois Hospital & Health Sciences System, the John H. Stroger Jr. Hospital of Cook County, Rush University Medical Center and the Jesse Brown VA Medical Center; as well as Malcolm X College and the United Center, the home stadium of the Bulls and the Blackhawks. The station first opened in 1958. Aside from renovation of the Damen entrance in 1998, it has only received minor patchwork repairs. The project saw improvements to all three entrances — the complete reconstruction and extension of the main stationhouse on Ogden Avenue, including the addition of an elevator to the structure to make it accessible to customers with disabilities; the upgrade of two station-to-platform ramps at the entrances at Damen Avenue and Paulina Street; upgrades to station and platform lighting; the installation of new security cameras; new CTA bus and train tracker displays; and enhancements to the station platform canopy. The two entrances at Damen and Paulina also were refurbished with new flooring, wall and ceiling finishes, fare-payment equipment and customer-assistance kiosks. The station upgrade was designed by EXP Services, based in Elmhurst, Ill. The station largely remained open throughout construction, with the exception of temporary entrance closures. The CTA worked closely with local elected officials and community members to minimize impact to riders, as well provide regular project updates and information regarding service disruptions. 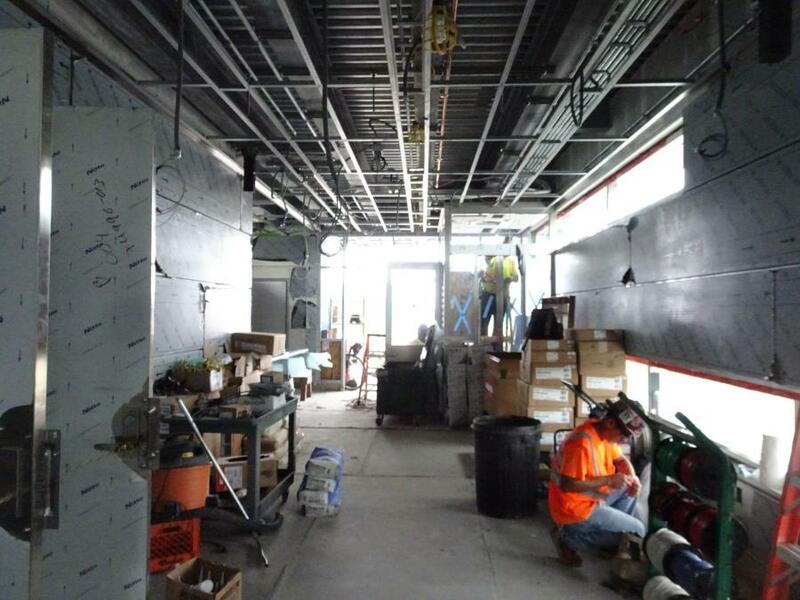 Construction crews faced both expected and unexpected challenges as they navigated the demolition, reconstruction, and 35-foot extension of the Ogden Station House and upgraded the Paulina Station House and Damen Station House interiors and exteriors. None of the challenges, however, was unusual for the rehabilitation of a 60-year-old structure, particularly one that experiences such heavy foot and rail traffic. The Paulina and Ogden station houses were first closed July 28, 2017, when construction already had been under way for several months. According to Carlos del Val Cura, vice president of McHugh Construction, it was during that closure that the full extent of the rehabilitation needs became apparent. A storm in the summer of 2016 caused significant damage to the Paulina Station House roof, requiring the scope of work to be extended. Originally, crews were charged primarily with interior upgrades, but because of the extent of the damage, crews ultimately replaced all the aluminum framing with a new front system. Additionally, and unrelated to the storm, an analysis of the Ogden Station House structure revealed severe structural deterioration and sheared bolts in the canopy system. At that point, the CTA determined it was more responsible and cost-effective to demolish and reconstruct the Ogden Station House, as opposed to rehabilitating it. 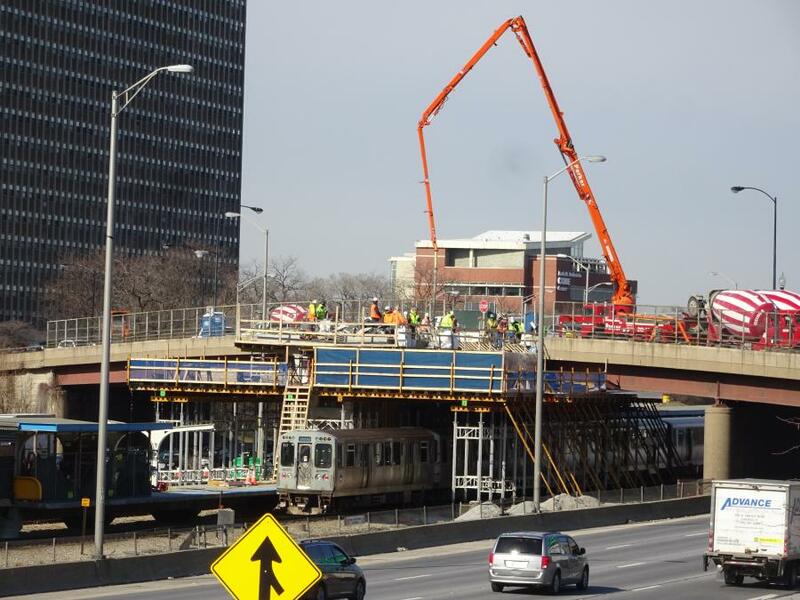 The unexpected adjustment in scope resulted in significant changes to the design and construction plans, particularly because the CTA rail line remained active throughout demolition and reconstruction. "We worked closely with both the CTA and Illinois Department of Transportation to ensure our work could be done with minimal disruption to both public transportation users and vehicle traffic," said del Val Cura. To make up for lost daytime hours, much work was done at night and on weekends. The workspace also was tight, given that construction stretched nearly half a mile, adjacent to two live rail lines and eight lanes of traffic on a major expressway. "To account for the worksite challenges, we communicated timelines and expectations clearly to our crewmembers and subcontractors so work could be completed efficiently," said del Val Cura. "In many cases, we had to coordinate with as many as four or five subcontractors and project stakeholders to create these efficiencies and keep the project on schedule." With passengers coming and going, bringing in equipment was not always easy, especially large pieces, but phasing construction helped. The majority of the materials used on site were delivered on an as-needed basis due to the limited space, even when lane closures were in effect. "We utilized time and space very strategically throughout construction, especially as it related to the platform work" said del Val Cura, whose teams closed each of the two 200-ft. platforms at the Ogden Station House in phases, thus maintaining a safe worksite for the crew and the nearby pedestrian foot traffic. 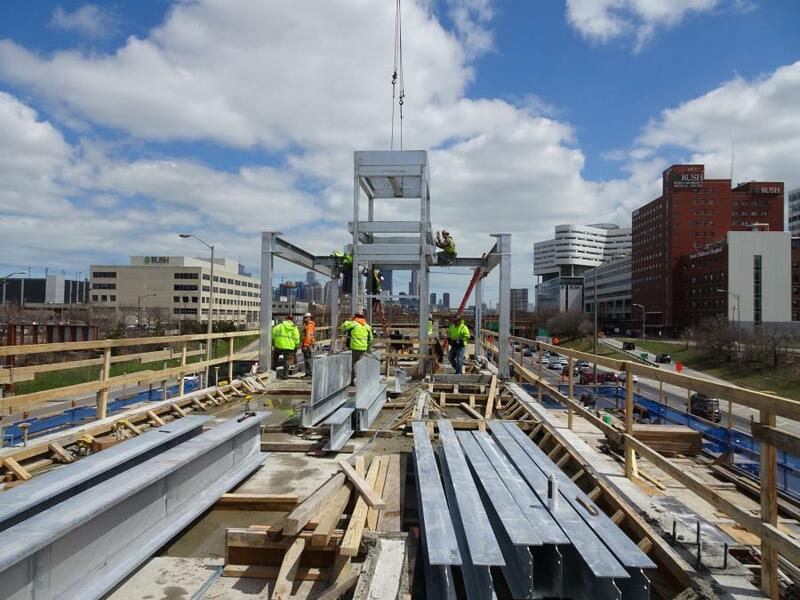 "Platform construction was done during off-peak daytime and overnight hours, and our phased construction allowed us to coordinate the redirection of CTA trains to the open track and open platform, allowing us more space to work." On the exterior, crews had to remove platforms, dig duct banks and install several caissons for the platform extension, which required several cranes. The structural demolition of Ogden also required cranes, along with concrete pumps. Replacing the one-stop elevator at Ogden, however, was fairly straightforward. "We were mindful of project benchmarks and deadlines, especially as they related to the elevator installation, which was a first for this station," said del Val Cura. "We worked closely with our electricians to make sure power was wired, and then completed the enclosure and roof portions shortly thereafter." There were no utility relocations, but crews identified a potential issue early on when they found a traction power duct bank running beneath the platform where the caissons were located. That information was reported to the CTA and its designer, who redesigned a portion of the caisson to avoid the potential conflict. "We knew a project of this magnitude would be challenging, which is why we chose the partners we chose," said del Val Cura. "McHugh has a long history of performing rail and infrastructure projects, and the subcontracts we partnered with know what it takes to be successful on these types of projects, despite the challenges they present." In total, the project saw the removal of 320 tons of concrete, 15 tons of steel and 60 tons of various debris; and the addition of 475 tons of concrete and 80 tons of steel. All concrete removed from the project was recycled. On a peak day there were 20 plus joint-venture and subcontractor employees on site. The subcontractors included American Concrete Restoration for concrete repairs, Aldridge Electric for electrical, Binzel Industries for the furnishing and installation of structural steel, Glass Designers, Inc. for storefronts and glazing, and Jones Architectural for exterior panels. On this project the joint venture used 40- to 115-ton cranes; Cat 330 and Bobcat E55 backhoes; Bobcat and Takeushi TS 300 skid steers; JLG-400, JLG-600 and Genie S-40 manlifts; and a Genie GTH-644C forklift. McHugh and UJAMAA purchase and rent equipment from Illinois dealerships such as O'Leary's Chicago, Ahern Rentals in Lemont, LaGrange Crane Services in Hodgkins, and Steven Crane, Rigging, & Heavy Haul in Bolingbrook. 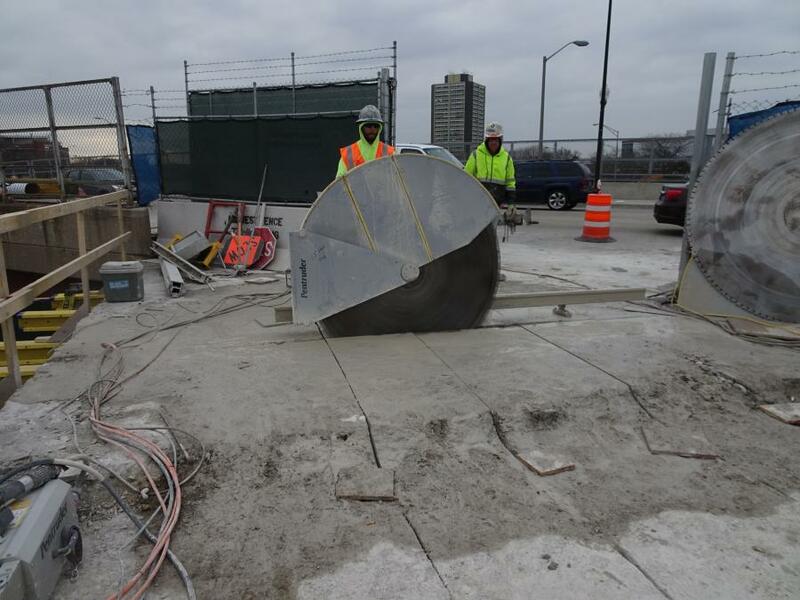 With the project in its final stages of completion, the contractors are confident that it will provide lasting benefits to the commuters in Chicago.